It’s a Jeep thing, they say. Look up the most popular Jeep hashtags on social media and you’ll find #jeeplife #jeepgirl and #itsajeepthing, but how do you exactly quantify this overwhelming emotional wave of Jeep-related phenomena. What does it all mean? As it just so happens, I’ve been handed the keys to a cheeky looking 2016 Jeep Cherokee Trailhawk for the week. I’m told that even though it’s not as credible as the Willys Jeep that helped the Allies win the second world war, the Cherokee can still handle itself on any terrain thanks to that little red Trail Rated badge perched on the left side of the vehicle. 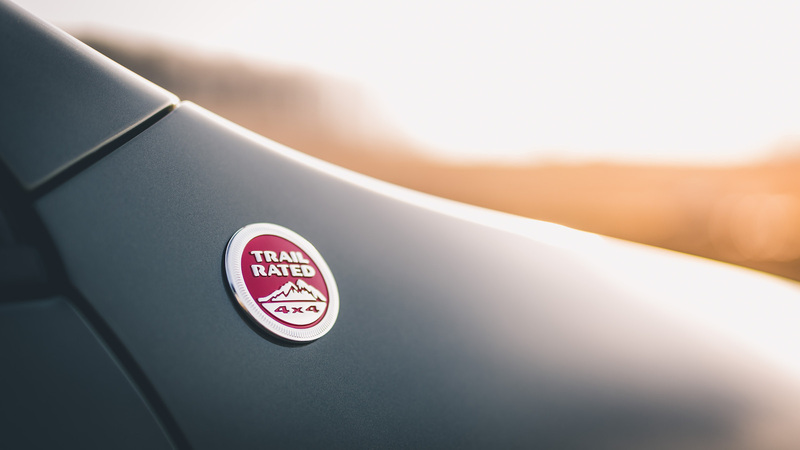 Trail Rated is Jeep’s way of stating that it’s been designed and approved to hit the meanest of trails – whether that means crossing a bed of water, hiking up a steep hill, or trenching through the forests of Narnia, the Jeep can manage. The other T word on the vehicle and the one worth noting, is Trailhawk. 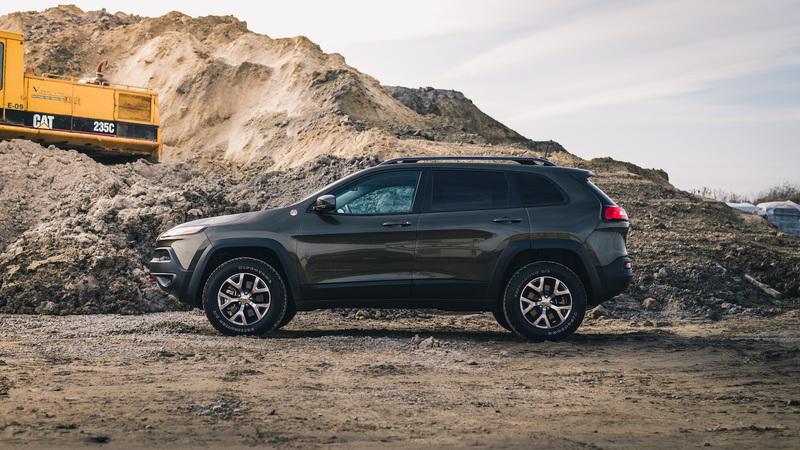 No, it’s not some Native Special Edition; rather it’s the off-road-focused version of the standard mid-size Cherokee SUV with some additional hardware. This trim is also found on the smaller pasta-munching Renegade. With this Trailhawk trim, the Cherokee receives very deep approach and departure angles due to slimmer front and rear fascias, a 25-mm (one-inch) gain in ride height to get over humps and bumps for a total of 220-mm of ground clearance, a two-speed transfer unit with a locking rear differential, skid plates, and signature red tow hooks up front and out back. 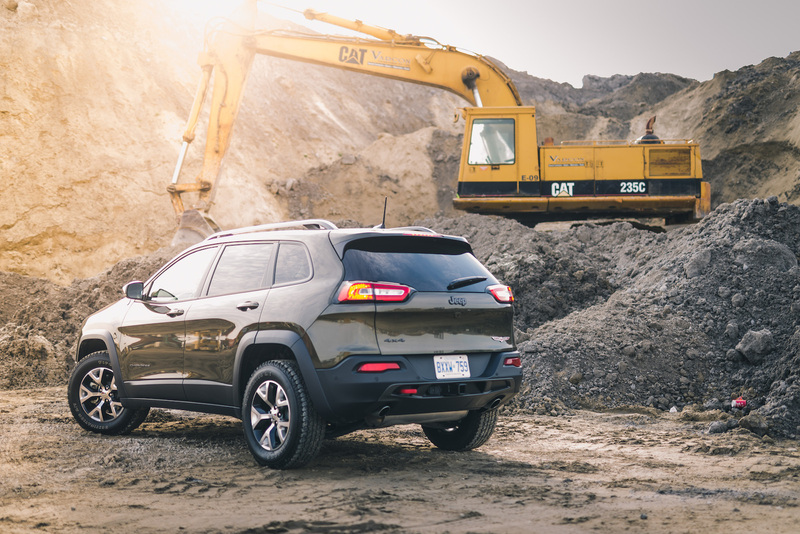 Will all drivers take advantage of the Trailhawk’s finesse and competency on the rocky wasteland? Probably not – the closest that most drivers will come to off-roading is running over J-walkers while fighting for a Whole Foods parking spot, or maybe a little obstacle that they like to call snow here in Toronto. Then what are customers buying the Trailhawk for? Well, one reason could be for the looks. Draped in some sort of army-style paint that they call Eco Pearl Green (not a very suitable name in my opinion), it gives off a striking appeal with some macho 17-inch Firestone tires to finish the package. 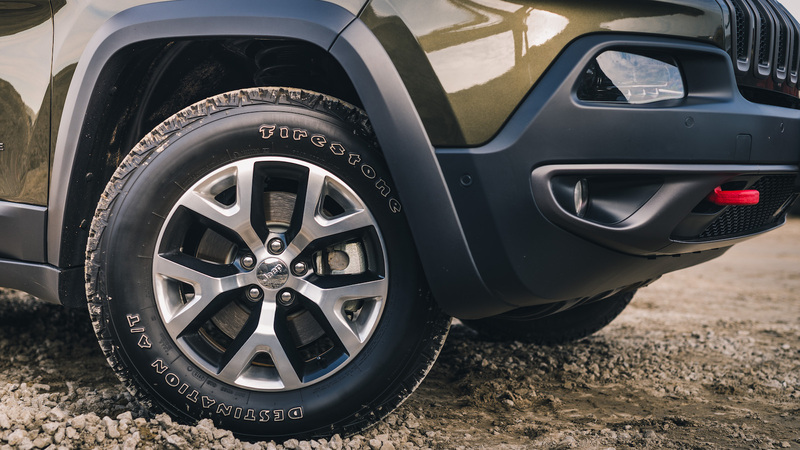 The tires have also been scribbled with iconic white lettering, paying homage to the Jeeps of the past. Out front, it’s the usual seven-slot grille but with a beaky nose and squinty LED running lights instead of the traditional flat Jeep face with round lights. 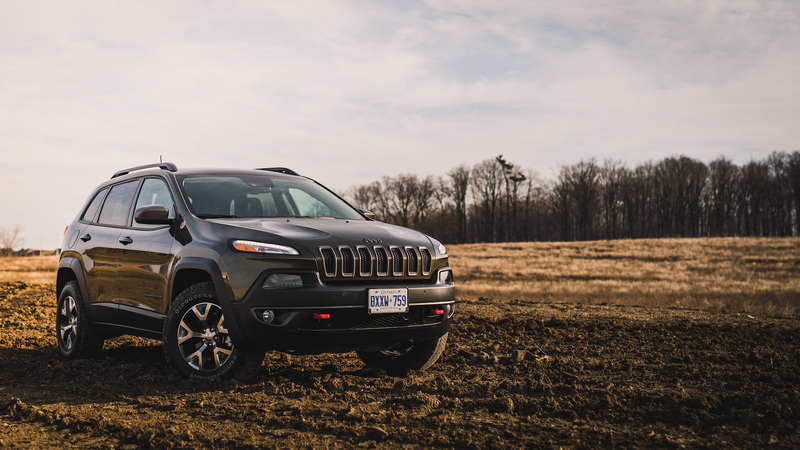 The Cherokee’s controversial contours have gotten a fair amount of negative reaction from Jeep loyalists but it’s slowly growing on the rest of us, and the strong sales numbers prove that. And the interior is a huge plus as well. 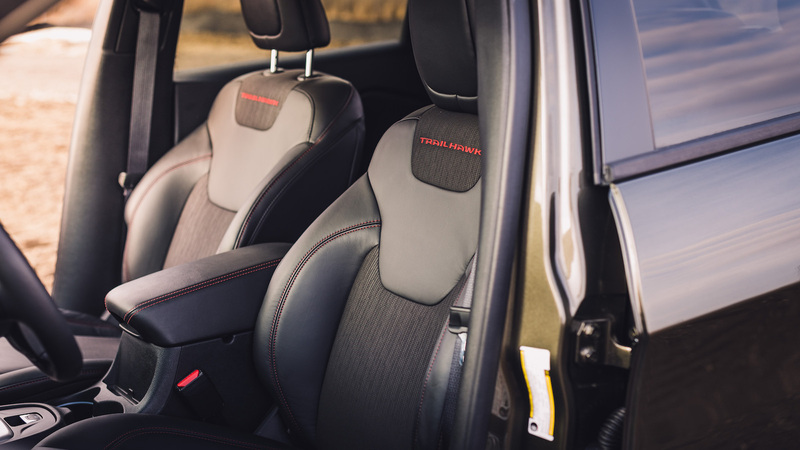 Smartly packaged and well appointed, the Cherokee Trailhawk offers seating for five with a generous amount of headroom and legroom no matter which seat you choose. 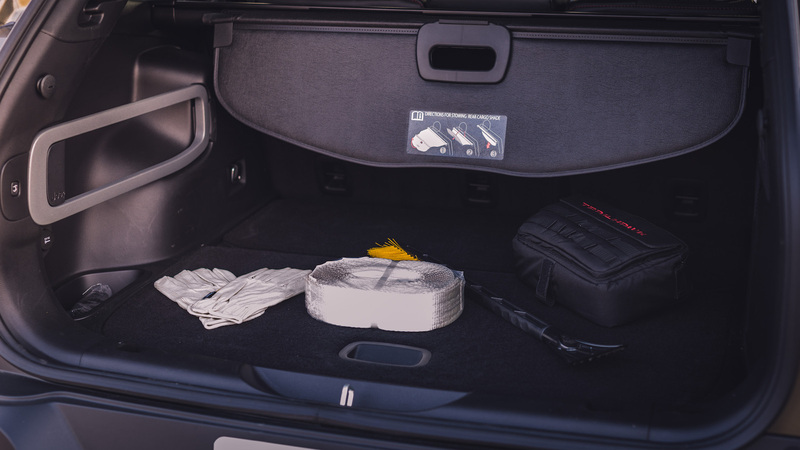 Storage options are aplenty – there are hidden cubbies on the dashboard, under the seat, in the consoles and under your nose, but the trunk is not as impressive when compared to others in this hotheaded mid-size SUV segment. The driving position is also a bit awkward – let me explain. The steering wheel is angled upwards like it is on a school bus or tractor-trailer, so it forces me to sit incredibly upright so that my hands can comfortably reach the top of the wheel. Not only do I have to pull my seat higher, but I have to lower the steering column as well – drivers with long arms and short legs will benefit here. On the bright side, the infotainment screen is lovely. Even though my other colleagues carry some sort of ghastly animosity towards it, I find it quite easy to use. Slightly updated for 2016, you can now customize the shortcut bar along the bottom of the screen like you would on your iPhone – simply press and hold the icons to drag them around whichever way you want. So if the heated seats and navigation screen are a priority for you, make them a shortcut at the bottom – it’s brilliant. Having a standard remote start option on the restyled keyfob is also a hidden gem. 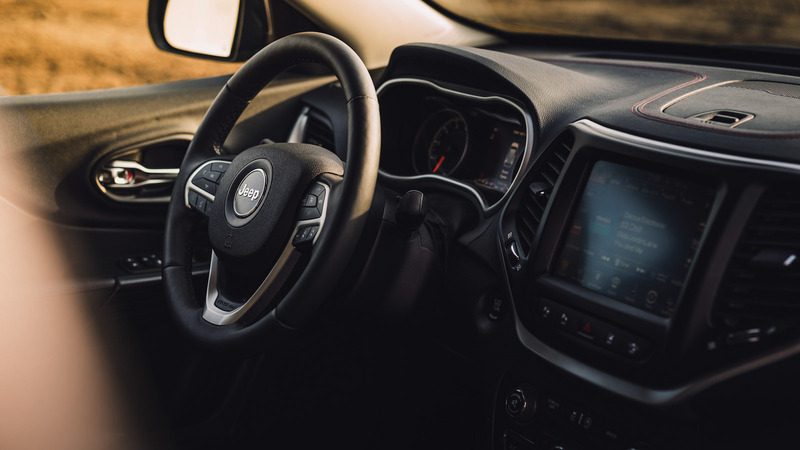 Unlike some GM vehicles that don’t turn on the heated seats or heated steering wheel when you remote start, you can program the Cherokee to do so. 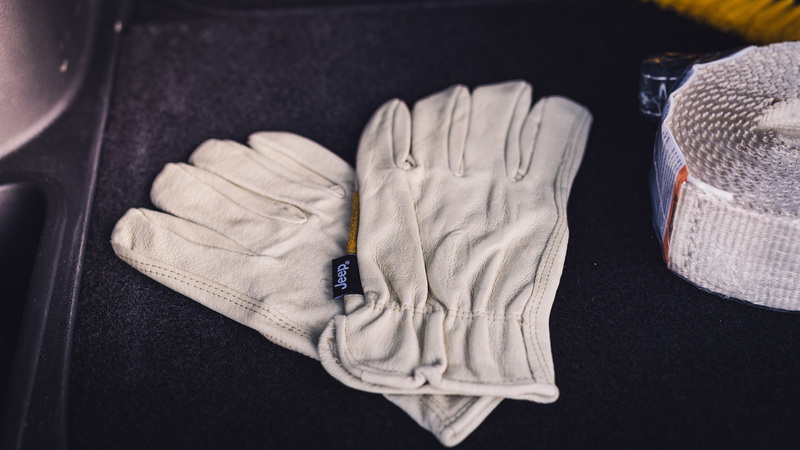 It makes a huge difference when warming up your car on a cold night from the cozy confines of your house. By now you might be wondering what the Trailhawk hype is all about. A regular Jeep Cherokee is already persuasive enough to brainwash legions into joining the incessant hashtagging marathon. Perhaps when we peel back the layers of the Trailhawk’s epidermis, we will think otherwise. 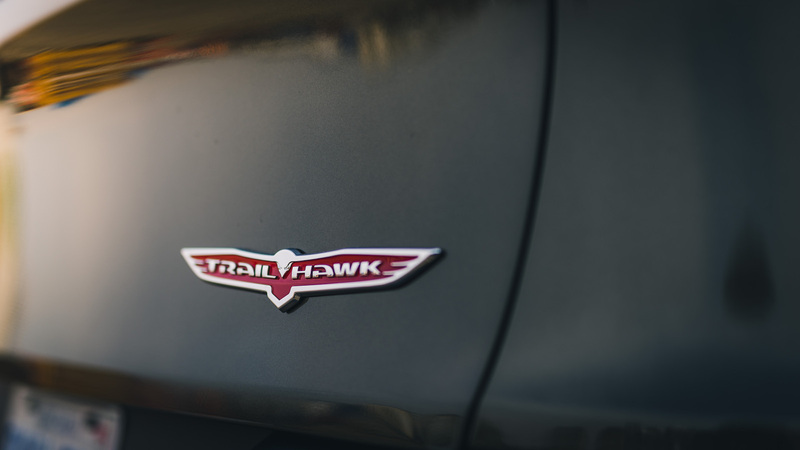 Cherokee Trailhawks come with a standard 2.4-litre Tigershark 4-cylinder engine, but with the car weighing in at 1,863 kg, the brawnier 3.2-litre Pentastar V6 seems like the logical route to take. Producing 271 hp and 239 lb-ft of torque, the $1,595 premium goes a long way. In return you receive linear throttle response and playful low-end thrust. There’s a nice burly whine when the V6 is revved up and it delivers decent road manners as well. The V6 also comes with a smooth iteration of start/stop technology, whereas the 4-cylinder does not. Spotters guide: the way to tell the difference between the 4- and 6-cylinder models is to count how many exhaust tips they have out back. 4-cylinders have one exhaust tip while the 6-cylinders get two. There’s only one transmission choice for the Trailhawk and that’s a 9-speed automatic. The shifts are smooth but the gearbox is always eager to hit the top gear and races there rather than squeezing out the subsequent gears for power. It makes not for a lazy transmission, but an economical one instead. Even if you wanted to shift your own gears, you can’t. Instead, when you knock the gear shifter into the “manual shifting” slot, it engages ERS, or Electronic Range Select. This allows you to select the range of gears you want the transmission to use (e.g. from 1 through 5, or 1 through 9), but you can’t choose which specific gear you want to be in. You can only limit the choices. The ERS mode is quite binding if you desire total control of the gearbox, but I’ve learned to let the computers manage it by themselves. They don’t do that bad of a job. 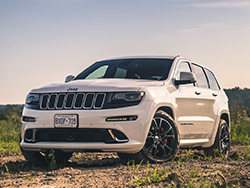 The Cherokee shares its underpinnings with the family tree: Chrysler 200, Dodge Dart, and Fiat 500L, but the Trailhawk rides a bit rougher than the last standard Cherokee 4x2 that I drove. Perhaps the occasional bounciness and jittery vibes coming up through the chassis were due to the lifted suspension or chunkier Firestone Destination A/T tires. 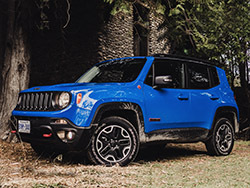 However, the Trailhawk manages to feel composed on the road with very light steering and well controlled body motions – one could even call it athletic. 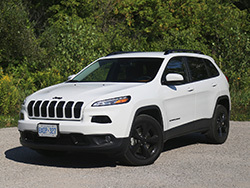 Overall, the Cherokee is an excellent cruiser with an effective four-wheel drive system. 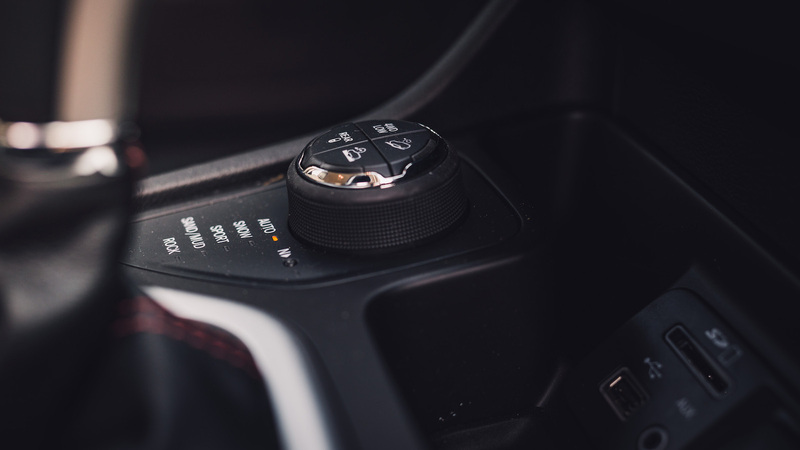 On the Trailhawk, you get Jeep Active Drive Lock, a two-speed transfer unit with a rear locking differential, and Selec Terrain, which allows you to choose from a number of modes via a rotary dial on the center console: Auto, Snow, Sport, Sand and Mud, and Rock. These modes are self-explanatory but what about those cryptographic symbols on the top of the dial? What do those mean? Time to get our newbie off-roader hats on. Let’s run through them real quick. 4WD Low is a mode that reduces the gear ratios and allows the wheels to create a greater amount of torque. The vehicle moves at substantially lower speeds but the tradeoff is a boatload of torque and superior rock crawling ability. Rear Lock will lock the rear axle for improved traction. This keeps the Jeep moving even if one wheel isn’t touching the ground. This will also make sure you don’t get stuck in the mud. 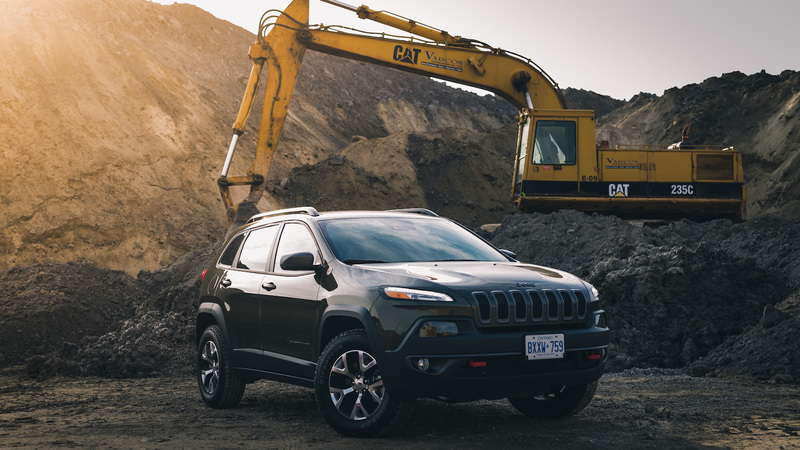 Hill Descent Control will maintain your Cherokee at a selected speed to descend down steep terrain, while Selec Speed Control will maintain a slow driver selected speed (below 32 km/h) while navigating on any off-road terrain. Phew, not too bad right? I don’t need to tell you that any Trailhawk in the Jeep’s armament is incredibly capable. 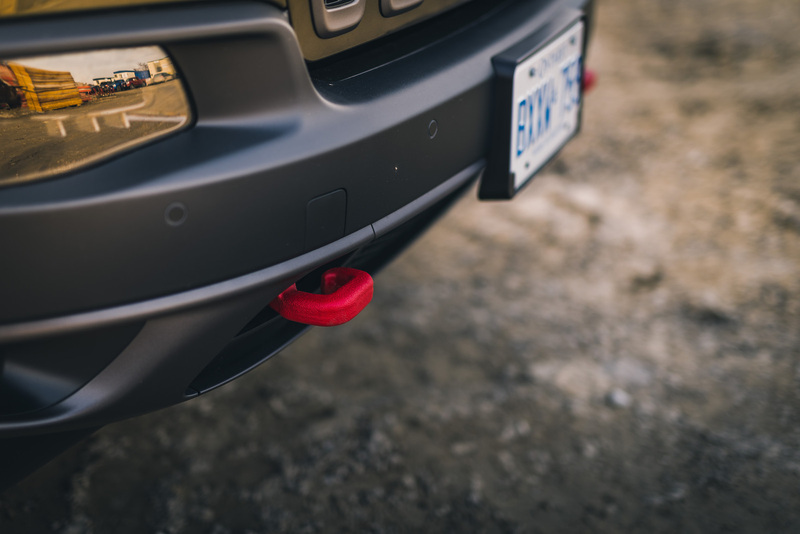 A true off-roader, the Cherokee Trailhawk is, but I’m starting to wonder if most people would just buy this trim for the flair and those stylish tow hooks rather than its rock crawling potential. Do most owners even touch that Jeep Selec Terrain rotary dial? Or are most left for the dust bunnies. Think of the popular Parajumper jackets that started a huge winter jacket fad around the world. It’s a classic case of form over function – no one is actually going to go parajumping with those flimsy parachute hooks, and they’re not even that warm either. And the same goes for the Trailhawk. My guess is that most people are choosing it for the appeal and following their subconscious dreams of living in some sort of wannabe off-roader paradise. Or maybe it’s a Jeep thing. Maybe I’ll never understand.